I promise pictures and a recap of yesterday's stairathon tomorrow. 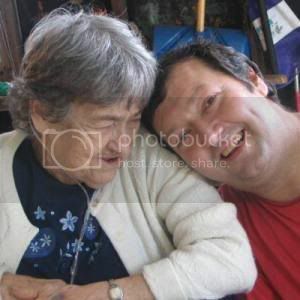 For today, though, I want to tell you a few stories about my grandmother, who passed away on this date four years ago. My grandmother met my grandfather on the beach in 1948. There was a resort in Connecticut, Ted Hilton's, that had a pool and sports and all sorts of fun activities. My grandmother, who lived outside of Boston, went with her best friend Gertie; my grandfather lived in the Little Italy neighborhood of New Haven, CT, and he went with his best friend Sal. This picture was the day they met - it was instant attraction. They dated for a few months and got married in early 1949 (I'm not sure what month, but I know they went down to Florida for Yankees Training Camp for their honeymoon since my grandfather is a lifelong Yankees fan - they have honeymoon photos of themselves with Joe DiMaggio. Phil Rizzuto, and Yogi Berra!). My grandmother dropped out of high school since she saw no point in it - according to her father, her best bet was to try and convince someone to marry her. She never thought she would - who would marry someone with a body like hers? Her father was very verbally abusive, and his biggest complaint was always how fat she was. 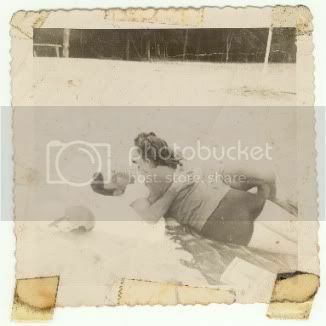 Even as she aged, I think the most my grandmother ever weighed was 150 pounds. Looking at this picture of a young girl, a little younger than me, totally twitterpated with a tall, dark, and handsome Italian boy she just met on the beach, it breaks my heart to think that someone she loved treated her so poorly because of her body. She married my grandfather as soon as possible (she was 22! ), not only because she loved him, but because their marriage meant my grandfather would save her from her home life. My grandmother was always dieting. After having nine kids, she went on a strict diet and got back down to 135 pounds - her marriage weight. Somewhere at their house, there's a picture of her wearing her wedding gown, sitting in the backyard, surrounded by all her kids. My dad was always incredibly close with his mother, and she felt every ounce of his pain with his own dieting problems -she never wanted her kids to feel judged the way she had growing up, and so she worked right along side my dad on the Weight Watchers diet I wrote about last week. After my parents got divorced, my dad moved back in with his parents. It wasn't completely awful since my grandparents lived in Florida nine months out of the year, but still, being 12 and living in a house full of people in their 70s and 80s was exceptionally difficult. I was well over 200 pounds by the second year of living there, yet I resented my grandmother for telling us we should try to lose weight - it was before I knew her story, and all I saw was someone trying to take away the only coping mechanism I had. I still loved her, but I was so overwhelmed with my own anger and frustrations that I never got terribly close to her emotionally. When my grandmother passed away in 2006, I was profoundly upset. First, because I had generally avoided going over to see my grandparents in recent years because of the old resentments; but also, because I was finally growing up and maturing, and now that I wanted to hear her stories and learn about her life, she was gone. I never got to sit down and have a real, grown-up conversation with her. A wealth of information, a lifetime of trials ... gone. I was sad for the loss, but also quite mad at myself. At her funeral, everyone told stories and shared pictures, and one of the ones that hit me the hardest was hearing someone I'd never met tell me how proud my grandmother was of me for graduating high school. If I could spend five minutes with my grandmother, I would ask her what heaven is like, and if she plays Scrabble with my great aunt like they used to, and what she thinks is the most important advice to keep in mind about life. And I think I would take a few minutes and tell her that I love her, that I miss her, and that I'm sorry we never got to watch her favorite movie together ("Gone With the Wind"). I would tell her that I'm finally getting my life together and trying to lose weight and get healthy, and I would thank her for always caring about my and my sisters' health, even if we weren't ready or willing to listen. I loved hearing about your Grandmother, too. What a story. I believe when people get to heaven, they have access to all knowledge, and I believe she knows how you feel about her, and is happy that the seeds she planted into your life are now blossoming. That's a wonderful legacy she left you.